A sombre-looking, slightly-built young actor who has made his mark on film, television and stage, coming to the fore as an obsessive surfie in Blue Juice (d. Peter Salmi, 1995), as object of the attentions of The Land Girls (UK/France, d. David Leland, 1998) and as upper-class student, Winston, in Lock, Stock and Two Smoking Barrels (d. Guy Ritchie, 1998), after building up a very solid CV throughout the '90s. He was a compellingly ambiguous cop in TV's Undercover Heart (BBC, 1998), the enigmatic lead in the miniseries, Our Mutual Friend (BBC, 1998), and the explosive, damaged protagonist of Antonia Bird 's Care (BBC, tx. 8/10/2000). 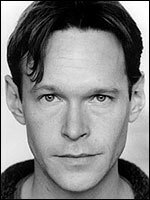 Also, in 2000 he returned successfully to the stage, after nearly a decade's absence, at the Royal Court , in David Hare 's The Zinc Bed, having made his debut aged 13 and been with the National Theatre in 1988. He is married to actress Lisa Jacobs , who played the title role in The Attic: the Hiding of Anne Frank (ITV, tx. 17/4/1998).